Marrickville Council has numerous opportunities for local artists. Applications are invited now for a range of programs for residents and practicing artists that encourage participation of arts and cultural activities at all stages of life. “The local community has told us that one of the areas they want Council to focus on achieving is a robust economy with flourishing urban centres and a range of creative and other industries,” said the Mayor of Marrickville Councillor Morris Hanna. The Marrickville Contemporary Art Prize 2012 is now open. 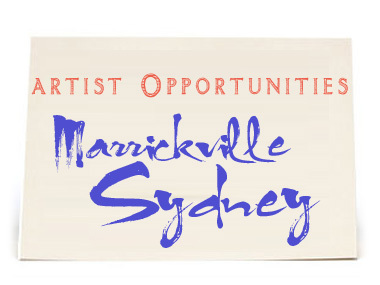 Artists must live, work, or have their studio in the Marrickville local government area. Prizes include $6,000 Open Award ($3,200 cash plus $2,800 for solo exhibition at ATVP), and the $500 People's Choice Award. The Program provides one to three months professional development opportunities for artists while promoting cultural understanding and development by providing accommodation for Resident Artists who are expected to do their own work and to make a contribution to the cultural life of the Marrickville community. Artists from a range of mediums can exhibit at the Chrissie Cotter Gallery in 2013. The gallery has 17 metres of hanging space, plinths, parquetry floor, wheelchair access and kitchen and toilet facilities. Gallery rental is free in return for 15 per cent commission. The Artseat delivers innovative and contemporary visual art to the local community and provides local, emerging and established artists a space where experimental, non-commercial art can be showcased. A fee of $1,500 is paid to exhibiting artists. The Newtown Artseat is funded by Marrickville Council with support from Arts NSW and the City of Sydney.